Christmas morning we walked to the Chao Phraya River and boarded the express ferry north bound for the Grand Palace and Wat Pho. The Chao Phraya river was still way above normal, and at high tide we noticed the ferry boat barely fit under the bridges. However, there were only a few sections along the river that still had sandbags up, and only one place that we saw evidence it happened. While it may not be the prettiest or cleanest river (especially when we were there), it flows right through the heart of Bangkok and it is a great way to see the city. The ferries were easy to use, very inexpensive, and stopped at many of the major attractions. During our 20 minute river journey, we recognized a lot of the buildings we saw on our bike ride yesterday, and we ended up docking just north of where we were. The Palace grounds opened at 8:00am and we were there by 8:10. We were hoping to beat the crowds. No such luck… 🙁 …it was already very crowded and hard to get pictures that didn’t have a bunch of other people in them. 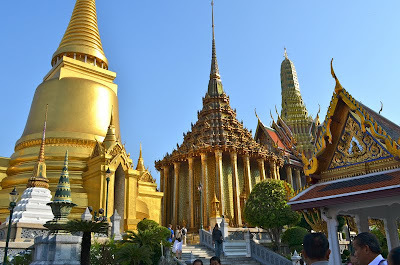 The whole Grand Palace complex is actually quite large and consists of many different buildings, courtyards, lawns and gardens. Only about a third of the property is even open to the public, since much of it is still used for official business. 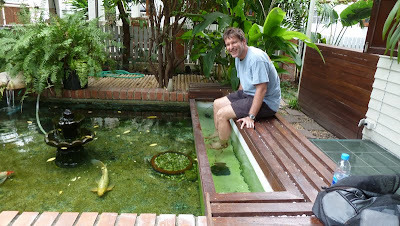 It’s rather expensive to get in but we both really enjoyed it. It would be much better though if they limited the number of people in there at any one time. We started in the Outer Court (a huge lawn area) where we could see the spires and rooftops peaking over the wall of the temple. 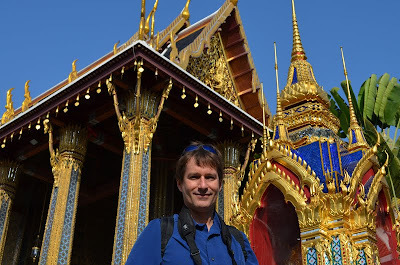 Most people come to the Grand Palace just to see this temple – Wat Phra Kaeo (Temple of the Emerald Buddha). It is considered the most sacred wat in Thailand, and it was the private chapel of many past Kings. 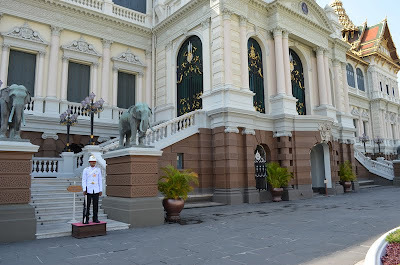 The 26 inch high green statue (which you can’t take pictures of and you can barely see since he is so high up) is believed to be the protector of Thailand. Only the King is allowed to touch him (when he changes his garment every 4 months). The buddha is actually made out of one big piece of jade (not an emerald), and this little fella has quite an interesting history (much to long to write about here). Over the last 2000 years he has resided in India, Sri Lanka, Cambodia, Laos, and now Thailand. The temple’s layout was similar to all the other wats we visited except that it did not have monk quarters. The grounds were completely walled off from the rest of the Palace grounds, and the inside of these walls were covered with beautiful brightly detailed murals. By far the most memorable thing about this wat was how exuberantly ornate and over-the-top all the buildings were. There was so much detail and color going on, I felt dizzy – talk about sensory overload. There were itty bitty tiny pieces of glass, tile, gems, and porcelain on just about everything. The ordination hall (which houses the buddha) was huge and shimmered of gold and blue. The elevated terrace had a huge gold chedi, a large scale model of Angor Wat, a library and royal pantheon (which were not open to the public), and all sorts of mythical characters throughout. Anytime we glanced up we saw a sea full of spires. Interesting statues were scattered throughout the premises as well, including the hermit statue (at the entry), the colorful guarding giants (which were rather comical looking), and various creatures positioned at entrances or in gardens. 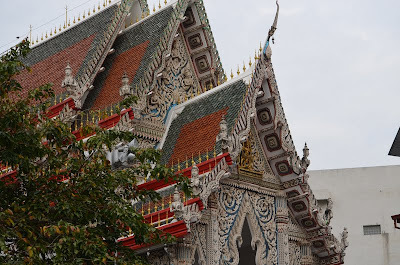 After spending nearly three hours at the temple, we finally (but reluctantly) moved on to the Grand Palace area. Wow – talk about a stark difference in architecture. All of a sudden we felt like we were transported to Europe. Buckingham Palace was the first thing that came to mind. The only part of the buildings that looked remotely Thai were the roofs. It was Sunday and the ceremonial halls were closed. Neither of us were that interested in this bit, so we just walked around the grounds and checked out the museum before leaving the Palace premises completely. 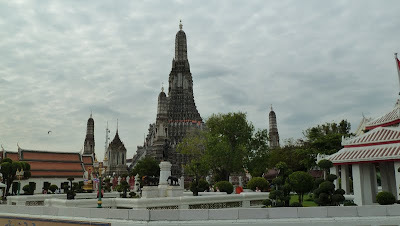 Wat Pho was not far down the road. Considered the largest and oldest wat in Bangkok, it was also the site of Thailand’s first university and the birth place of Thai massage. 🙂 It houses over 1,000 buddhas including the largest reclining buddha in Thailand (which happens to be almost the same exact size as the one we saw in Japan – so we really wanted to see it). When we arrived, the hall housing the reclining buddha was annoyingly over crowded, but with some patience, we did get a few good views of him. His feet were the most interesting part with all the inlaid mother-of-pearl scenes. It’s supposedly taller and longer than the one in Japan but it didn’t seem that way (maybe because it is confined to the inside a building). 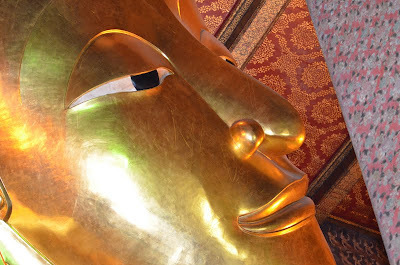 Even more than the reclining buddha, we both really enjoyed the rest of this wat since it was refreshingly uncrowded. We were able to relax and move at a much slower pace to see the buddhas and the almost 200 chedi located on the property. 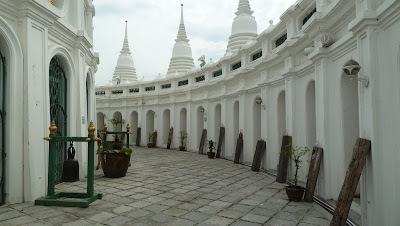 Given it’s proximity to the Grand Palace, many of the chedi here contain the ashes of past kings and their family members (another royal burial ground). I actually thought about getting a thai massage here, but we were too hungry and thirsty so we moved on to find a bite to eat instead. 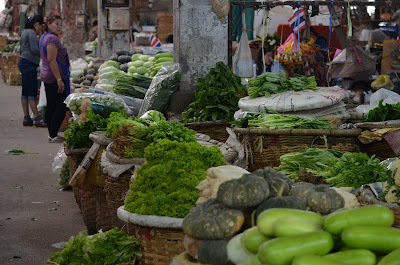 After a nice relaxing lunch and cold drinks at the Black Canyon Coffee Cafe we were now refreshed and ready to revisit the wholesale market which we zoomed through on our bikes yesterday morning. The market was literally right down the street and we found it pretty quickly. However, the markets were no where near as busy this time of day. Much of the merchandise had already been moved out or bought. We managed to snap a few good pictures while enroute to the ferry dock, but it just wasn’t the same. We cruised back down the river and when we arrived at the central dock, we decided to take the BTS (Bangkok’s above ground train) back to our apartment instead of walking. We were pleasantly surprised. The BTS was extremely clean, efficient and cheap. It was by far the best way to get around the inner parts of the city. I hope they continue expanding the routes – and we really hope they eventually link it up to the airport. We got off one stop early since we still had a couple hours before we had to get ready for dinner. For something really different we decided to stop at M.R. Kukrit’s Heritage House. M.R Kukrit was an interesting man (a member of the royal family, an Oxford graduate, a writer, actor, poet and a former Prime Minister of Thailand). When he died in 1995, he left his home to the public. His home is the result of 20 years of work on two acres of land in a residential area of downtown. 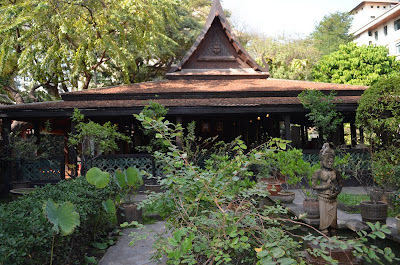 All the buildings on the property are authentic traditional Thai houses (some are over 100 years old). He brought them for various places in central Thailand and slowly reassembled them here (Thai houses are built to be moved). It’s a very unique place – as this was his actual home (which still had all his stuff in it) and not some decorated exhibition that was thrown together. I bet it is very rare to find this kind of property anywhere in Bangkok now. One building was an open pavillion with a stage and housed a huge collection of antique masks. The living quarters were made up of a group of small one room teak houses on elevated poles, creating a covered living space below that was open all the way around and surrounded by lovely gardens, pounds, and shrines. He also had an impressive collection of antique books, art, and furniture as well. I can only venture to guess what this piece of property is actually worth today. The oddest thing we found on the grounds was his pet cemetery which had a gravestone marked “unknown mice” (he obviously also had a sense of humor). Back at our apartment we had plenty of time to relax and have a cocktail before going to dinner. It was a 5-10 minute walk to a French restaurant (inside a lovely old home) at which we had our Christmas dinner. We didn’t have extremely high expectations but both of our dinners were actually quite delicious. As we sat there and ate, we realized just how unusual a Christmas this was. Can’t help but think that Santa must have thought we were awfully good this past year. 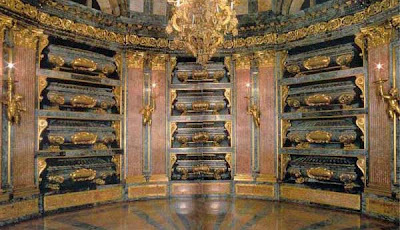 Check out these amazing places yourself, by clicking on the photo below. Where has the time gone? In less than four months we will be done with our first year in Japan. January and February flew by. We’ve had lots of little events over the last 8 weeks, so we thought we’d wrap them into a summary post. I have to admit, after New Zealand, most events almost don’t seem worthy of a post; however, we have had some interesting experiences that we don’t want to forget, and want to share with you. 1) The Country Western Bar Downtown: It was a night out for the whole school….an “All You Can Eat & Drink” – choice of various types of bar food, whiskey, beer and box wine (ha!) courtesy of the Chairman of the Board of Directors. He apparently is a big Country Western fan and frequents this place a lot (but he’s obviously not a wine drinker). This place even had a live band singing various honky tonk songs! I was actually really surprised such a place existed here…but it does and they do a pretty good job creating the right atmosphere. It’s not a very big place, but somehow we all managed to fit in….and a few people even “danced”. I was actually hoping there would be a nice big thick steak and baked potato there, but no such luck. They had pizza, pasta, salad, sausage, some rice dishes, and various other finger foods instead. And as hard as I tried, I just couldn’t get use to the Japanese band dressed in cowboy hats and tight blue jeans. It was almost as entertaining as seeing the Japanese waiters dressed in Mexican attire at El Barracho. They just shouldn’t do it. I wish I would have remembered to bring my camera to this event, however, the images in my mind still won’t go away. 2) The Van Gogh Exhibit at the National Museum in Dazaifu: This was truly a delight to see. It was so good, we almost went back to see it again. I’ve been to other exhibits and been disappointed by the number of actual paintings on loan of the featured artist(s) you get to see – and how far away you have to be from them, so I didn’t have high expectations going to this one. Well….to my (and everyone else’s) surprise, there must have been a hundred of Van Gogh works there AND you could literally get within inches of them. It was amazing to see all the detail, the depth, and the brush strokes! The way the paintings were arranged, the progression of his work from his first sketches to his most famous paintings was very apparent. Occasionally, there would be works from other famous painters that were either from the same era or which influenced his style. I would have loved to have taken pictures in there, but (even if I was allowed) pictures just can’t capture stuff like that yet. I also need to mention the number of people that were there…we were nearly packed in there like sardines! At times it was almost frustrating, but fortunately, they were able to keep the lines moving so that you could eventually see everything. You were also allowed to go back if you wanted to see something again. It was like walking through a maze, but it took you by every piece of work. I suppose the narrow halls would have bothered those individuals who like to study paintings from a distance, but I find his work more enjoyable close up. The only painting that wasn’t there that we would have really liked to see was Starry Night. Everyone seemed to have a different favorite. I’m not sure I could choose just one. Oddly enough, Van Gogh happens to resemble the person that works in the library with me…the students had a good chuckle with that. Lucky for him, he knows who to ‘dress up’ as for Halloween next year. I’m SO glad Typhoon Megi decided to vacation near Taiwan rather than Hong Kong….I really didn’t want to spend the next three days inside my hotel or in shopping malls. Fortunately, the weather ended up being perfect. Hong Kong feels like a San Francisco that’s being swallowed by ‘China Town’. There is no apparent language barrier here…everyone seems to know English. 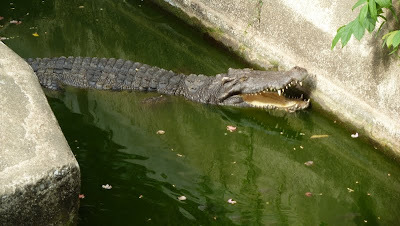 It’s very well organized and has a great and inexpensive subway system which I came to know intimately. I spent my first day exploring from Hong Kong Central to the Western Market. I would have preferred to explore everything with Robert, but unfortunately he was stuck in a classroom from 8:00 to 5:00…so he had to experience my day (and most of Hong Kong) through pictures. The first half of my first day took me through the British historic areas of downtown. It was odd to see small colonial buildings lost among all the steel and glass of modern day skyscrapers. Times sure have changed. With a little imagination, you could picture what it was once like. I really enjoyed visiting St John’s cathedral (a very tiny cathedral with ceiling fans!) which is thought to be the oldest Anglican church in the Far East). And not far from there, was the Government house and the Botanical Gardens filled with beautiful tropical vegetation and orchids. After such a relaxing and civilized morning, I was ready to take on the commercial markets. Hong Kong has an insane amount of high end shops (most of which seem to have no patrons), and then sandwiched on small alleys between these buildings which house the shops for Versace, Valentino and Tiffany’s are street vendors in make-shift stalls repairing shoes, and selling costume jewelry, handbags, and cheap knockoffs. The further East I went, the more exotic the shops got. There were whole streets dedicated to dried/preserved items…including seafood, mushrooms, flowers, roots, bark, snake skins, and ‘herbal medicines’. I can only imagine what eventually becomes of this stuff, and I’m not sure I want to find out. I finally came upon the antique district where there were hundreds of dealers with a huge array of artifacts from jade and carved ivory to gourds and old war propaganda posters. I’m a sucker for all things old and I would have loved to spend more time here searching for a treasure to bring back, but I really needed to be heading back, so on I went. My last stop for the day was Man Ho Temple (the oldest temple in Hong Kong). I passed on the palm reading, but I did go inside to view the large incense spirals hanging from the ceiling (that stuff makes me dizzy), and then I watched a few women bang the gong and burn their prayers in the big fire pit outside (sending their prayers to the spirit world). On my way back, fortunately I discovered the Central-Mid-Level Escalators…after walking all day my legs were numb – and those moving sidewalks were a godsend! When Robert returned from his training, we both headed for the SoHo area (stands for South of Hollywood). There were numerous bars and restaurants in this area for us to choose from. We decided on a small Italian place on one of the back roads to have our dinner. It was an extremely relaxing evening with great food and wine. It was exactly what we both needed. The owner and staff were fantastic and very generous. Neither one of us really wanted to leave, but all good things must end. On the way back we checked out the IFC mall and walked down to the Harbor area to check out the city lights. By the time we returned to the hotel we were both exhausted, but excited about what the next couple nights would have in store. A group of 11 of us took the trip to visit the monthly flea market and learn the ins and outs of train tickets and station transfers. We did a pretty good job except for when we found ourselves doing a stand-up comedy routine for the local Japanese passengers by going to the wrong platform (where no one else was) and sitting on the wrong train (which was empty) until the station manager told us to go to a different platform. A good rule thumb in Japan: if you go to a train platform and no one else is there and then you get on the train and no one else is on it, then chances are you are not in the right place. When we finally got to the right train, two older Japanese men next to us looked and pointed over to where we had been and were laughing “with us”. The grounds of the shrine were beautiful and the buildings were very interesting. But..it was brutally hot and humid. Rose and I walked around and took in the scenery and shopping as much as possible but we had to get inside to some air conditioning. So, we headed to the National Museum. We were glad we did…the architecture was stunning and the history on the inside was very educational. We certainly know a lot more about the role the Chinese and Koreans played in the history of Japan than we did before we went. We finally had lunch around 1:45, and I was starving. We were on our own at that point, so we just picked a restaurant on the main street that looked good. A young girl brought us our menus (which fortunately had a few pictures) and we played our usual game of “food roulette”. I ended up with some cold soba noodles mixed with a broth topped with shredded egg, wasabi, and re-hydrated fish of some kind. It was fantastic and very refreshing after the hot day. Rose ended up with a bowl of rice topped with a battered pork cutlet, a cooked egg and some type of sauce. And yes, it was also very good. After lunch we met up with the rest of our group and rode the trains back to Fukuoka without incident. We are all expert train travelers now! Click on any picture to see more photos of this trip.